Situated on the Continental Divide in southwest Montana, Butte is an old mining town as rich in history as it is in precious metals. 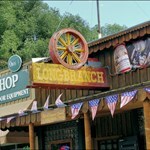 Centrally located between the Madison, Jefferson, Bighole and Missouri rivers. 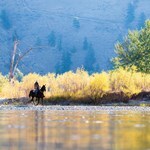 The Upper Madison begins its journey in Yellowstone Park. Soon after leaving the park boundaries into Montana, Hebgen Dam creates the first of three reservoirs on the Madison River. ... moreA few miles downstream another reservoir was created in 1959 by an earthquake and resulting landslide. This body of water is known as, “Earthquake Lake”. From here the Upper Madison flows through the Madison Valley, past the town of Ennis and into Ennis Lake. The Lake being the, “divider” between the Upper and Lower river. 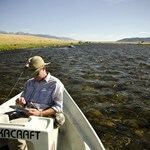 Known as the, “50 mile riffle” the Upper Madison provides great structure and trout habitat wherever you look. 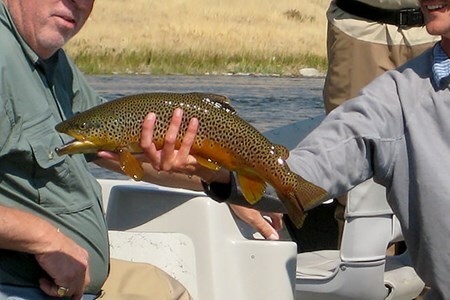 Healthy populations of Brown and Rainbow trout, as well as, a huge variety of hatches and methods to fish them, make this river a favorite for many of our guests. 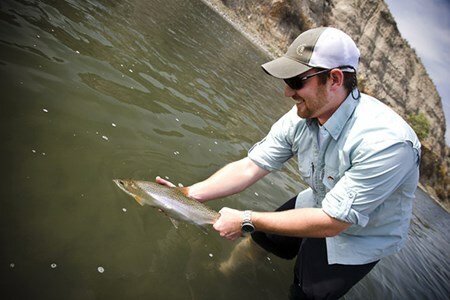 The Missouri River below Holter Dam offers fine Montana tail-water fishing. Nice sized trout in good numbers inhabit this section of the Missouri, which winds it’s way through broad ... morecanyon walls before leaving the mountains for the plains. 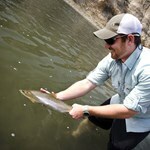 Both Brown and Rainbow trout call the Missouri River home, and are willing to take a wide variety of fly patterns. Because it is a popular fishing destination, the Missouri can see crowded conditions. Those seeking solitude may find one of our other trips more suitable. This section of the Missouri River is located 2 hours from our home of Bozeman, Montana. Our trips to the Missouri are a minimum of 2 days. 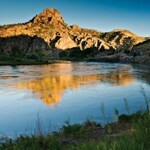 Our Missouri River Guide Rate is higher than our Standard Rate to provide for guide’s transportation and lodging. 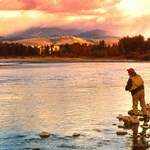 The Lower Madison provides memorable Montana angling adventures. The river begins below Ennis Lake, flows through the majestic Beartrap Canyon and 35 miles downstream to the Headwaters ... moreof the Missouri River. Because it is dam-controlled, the Lower Madison can be reliable when stream flows are higher in the Spring, and in late Fall when water temperatures start to drop elsewhere. 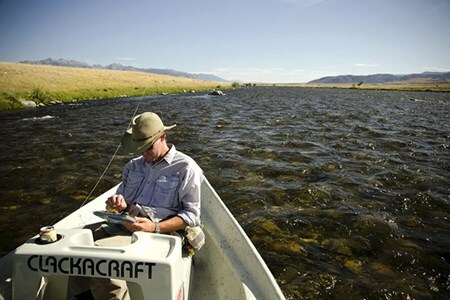 Although not as well known as its upstream neighbor, The Upper Madison, the Lower is an exceptional fishery that can produce trout in attractive numbers and size. 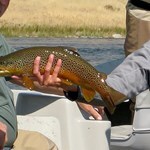 The Lower Madison is mostly known as a Brown and Rainbow trout fishery, though some cutthroats do exist in the river. Prolific hatches and large numbers of crayfish and sculpins make for very well-fed fish in The Lower Madison. On its way to the Missouri Headwaters, the Jefferson River passes through an assorted landscape. At the town of Twin Bridges, Montana the Ruby River, Beaverhead River and Big Hole ... moreRiver converge to form the Jefferson. In its early stages the river advances past hay fields, large stands of cottonwood and agricultural landscapes. As the river reaches the town of Cardwell, the Jefferson is then flanked by large canyon walls, home to Lewis and Clark Caverns. Downstream of the canyon the river again proceeds through farm and ranchland laced with cottonwood trees until joining the Madison and Gallatin rivers. 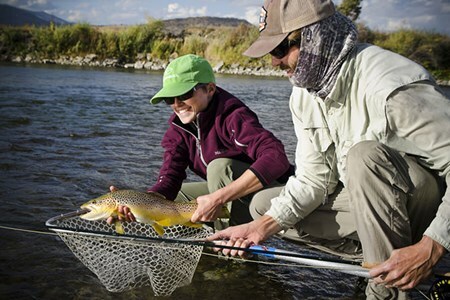 Though fishing on the Jefferson can be less consistent than on some of our other rivers, it can certainly make up for it with some very special moments. When the Jefferson is good, it can be great!